Why hire a MK2 Jaguar? With its great looks and superb performance this handsome sports saloon is a true legend. 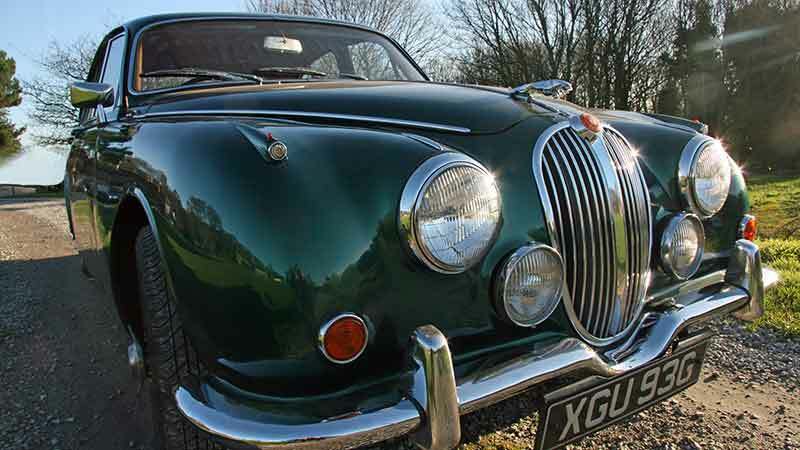 When you hire a Jaguar MK2 you are hiring a classic car which is in a league of its own. Jaguar have always wanted their cars to have ‘grace, pace and space’ and the MK2 certainly lives up to that motto, oozing class and character. In TV and film the Jaguar MK2 was a getaway car of choice in bank robberies, and featured in Inspector Morse and The Sweeney. Make your getaway with a Yorkshire Jaguar MK2 hire – its roomy enough to take your family or friends with you. But we hope you’ll leave the shotguns behind! 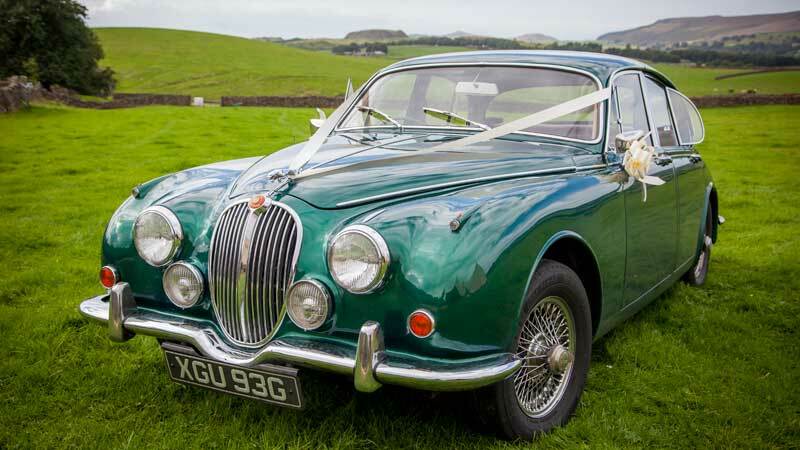 In metallic British Racing Green, it also makes a charming self-drive Jaguar wedding car. The gentlemanly cabin has delightful red leather upholstery and a wood-veneer dash. Jaguar created the most iconic 1960s sports saloon of them all with the Mk2 Jaguar. It’s feline shape – curved roof, arched back and rounded wings – make this elegant ‘big cat’ a comfortable choice for vintage car touring. A Jaguar MK2 hire lets you experience Jaguar’s most romantic, high performance saloon. It’s a mean classic machine, one of the fastest 4 door saloons of its era. 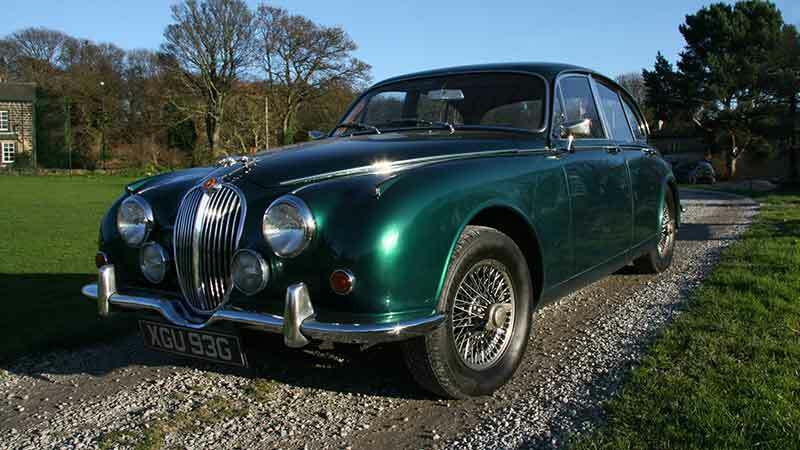 Our 1960 Jaguar MK2 hire car is a 4 door 4 seater saloon, finished in metallic British Racing Green. It has a roomy dark red leather interior, wood-veneer dash and chrome wire wheels. It also has a generous size boot, big enough for golf clubs. This glamorous and swift saloon has an upgraded 4.2 litre straight 6 engine with automatic gearbox and power steering. 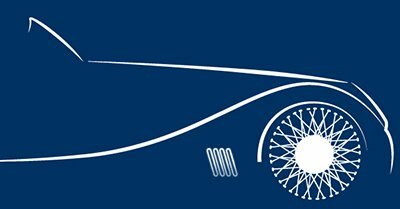 MK2s were designed to reach 60mph in approximately 8.5 seconds – very fast for its day and equivalent to modern day car performance. Our MK2 Jaguar has had a bare metal re-spray and an engine rebuild. This classic Jaguar benefits from an uprated ‘Coopercraft’ braking system, Coopercraft being Jaguar brake specialists. The MK2 Jaguar (also known as MKII) was designed in 1959 and produced in Coventry between late 1959 and 1967. Although its body lines were derived from the MK1, the MK2 received a skilful facelift, to become one of best looking cars on road, photographing well from any angle. Vision was greatly improved by a wider windscreen and rear window and enlarged side windows. The Mk2 Jaguar sold well and gained a reputation for bringing people of all classes inside Jaguar dealerships. Some 84,000 MK2 Jaguars rolled off the assembly lines, about 30,000 of them in 3.8 litre form (there were also 2.4 and 3.4 litre versions). It was driven by celebrities and racing car drivers, and is well known for its use by villains and law enforcement alike. Capable of 125mph in 3.8 litre form, it soon gained icon status from both its racing pedigree and its high profile use by both the police and the bank robbers of the day! Villains needed a car with top performance and enough space for the whole gang, so Police forces needed a car fast enough to catch them. In its time there was nothing that could beat the MK2 Jaguar. 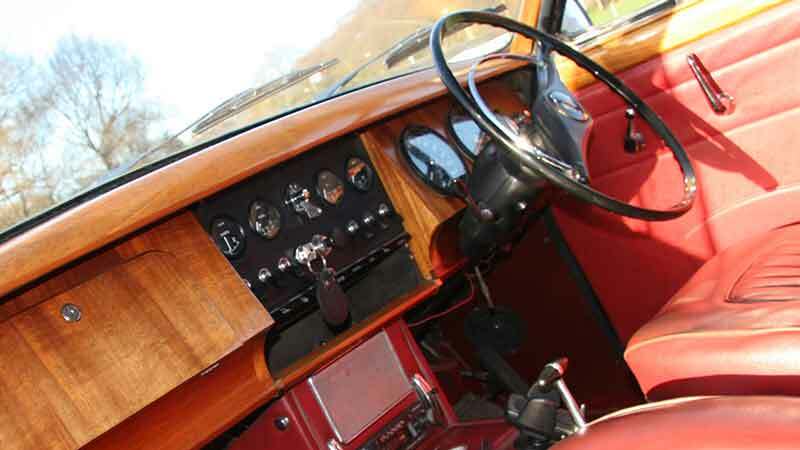 The Police version had the luxury fittings removed, with the walnut dash and door cappings being painted over in matt black paint. The Metropolitan Police also fitted a low ratio back axle which reduced the top speed but increased acceleration. When driving in London top speed is not really an issue. But being quick off the line gave a real edge over the standard version of the car used by the bad guys. The Jaguar MK2 saloon was as much at home on the racing circuit as it was on the road. It had great success on the race track, making a huge impact on the European Touring Car Championship series. The MK2 dominated our television screens in the 1970s, playing starring roles in Inspector Morse and the Sweeney. Famously driven by John Thaw in Inspector Morse, it became affectionately nicknamed the ‘Morse Jaguar’. This great Jaguar cemented the firm’s reputation for building superb sports saloons. It was a sports saloon that inspired a generation and became a national icon, a symbol of a golden age. With a Jaguar MK2 hire you’ll be inspired too! 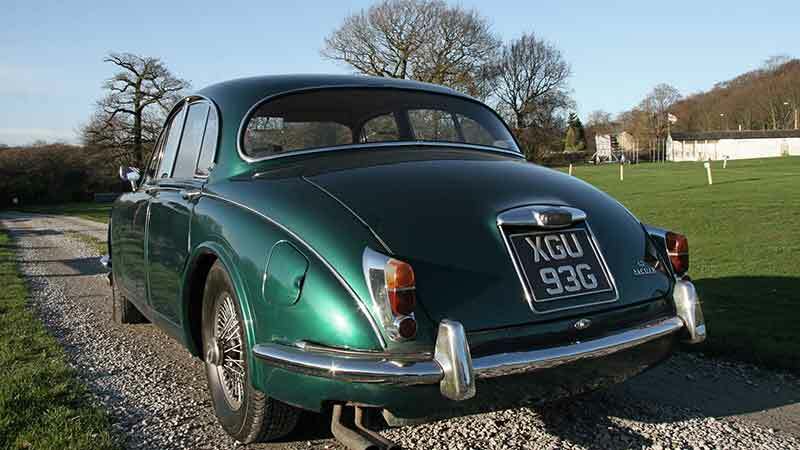 Hear more about our Jaguar MK2 hire car in this 1997 BBC2 documentary, ‘The Car’s the Star’. It includes Bruce Reynolds of ‘Great Train Robbery’ fame talk about the use of the Jaguar MK2 in his criminal career. Our Jaguar MK2 hire car is available for collection in Leeds, West Yorkshire. Our location is within easy reach of all the major towns and cities in the north of England. We are in an ideal location for Jaguar MK2 Hire Bradford, Huddersfield, Wakefield, and Harrogate. For Jaguar Mk2 hire Hull, Rotherham, Doncaster and Sheffield, you don’t have too far to travel either. York Jaguar MK2 hire is within about an hour’s drive of our Leeds base. As are most of the towns in South Yorkshire and North Yorkshire via the M1 or A1(M). Once you’ve collected it you can drive our Jaguar MK2 hire car anywhere in the UK subject to our terms and conditions.